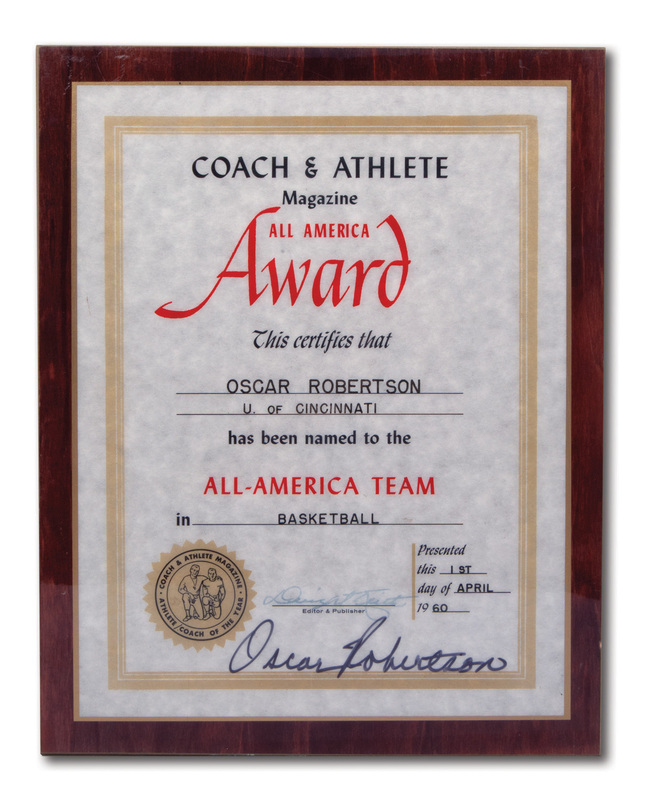 By Oscar Robertson’s senior year it was obvious he had the type of talent that came along once in a generation. In three varsity seasons with UC, “The Big O” single-handedly rewrote the Bearcats’ record book, led his team to a pair of Final Four appearances and put University of Cincinnati basketball on the map. The crowning achievement of Robertson’s collegiate career was being named Consensus First Team All-America as well as College Basketball Player of the Year for the third straight season. Thus, Oscar was easily named to the 1960 All-America Team by Coach & Athlete Magazine. In recognition of this honor, Robertson was presented with this 10" by 12.5" award plaque. Dated April 1, 1960, the award is signed on the bottom in bold black marker by Oscar, just below the laminated blue signature of the publication's editor. It comes just as Oscar received it 59 years ago. Includes LOA from Oscar Robertson.